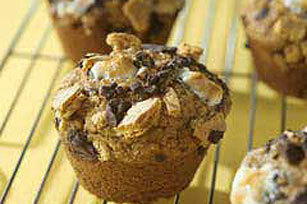 These graham cracker muffins were already scrumptious. Then we completed the s'mores trifecta with chocolate and marshmallows and they got even better! Prepare as directed, using cinnamon graham crackers for the coarsely crumbled honey grahams in the topping.